We were founded on September 2, 2015.
too much for our hearts to bear. We are a group of concerned Harrisonburg, VA residents who are dedicated to help Syrian refugees in the midst of the world's biggest humanitarian crisis. 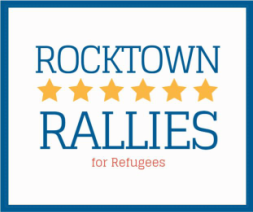 We also support local resettlement efforts for refugees from all areas of the world. Our hope is that our combined efforts will make resettlement easier for diverse refugees arriving in our community; that our advocacy will make a difference in local, state, and national policies regarding Syrian refugees; and that our service will demonstrate that good things happen for refugees and our communities when we work together. Watch "Unsettled," a short documentary film produced by SMAD students at JMU. Opportunities to make a difference surround us every day. We're glad to have you on board. We invite you to attend our meetings and events. Everything will be announced on here, and on our Facebook page. If you have special talents that you would like to share or ideas for projects/events, contact us!